There's no doubt about it, the dining room table is where memories are made. Whether you're entertaining guests or enjoying a family breakfast, the dining room table is often where stories are shared. Choose one that fits your family's style! 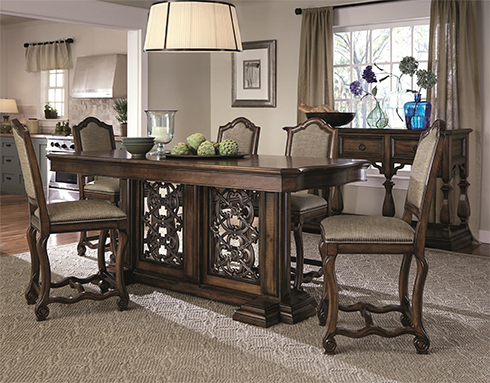 Formal dining room tables offer a beautiful appearance in your dining room at first look. That first impression means everything and walking past a beautiful formal dining room each and everyday may be exactly what puts a smile on your face. Pub height or counter height dining tables are also rising in popularity. This higher height provides a more comfortable atmosphere but still can be dressed up or down depending on your style and design choices. Casual dining room tables are often a necessity for eat-in kitchens. Especially in the Washington DC area, homes are being designed with both a dining room and an eat-in area in the kitchen or great room. Depending on your needs and style preference, there may be chair options for any dining table you choose! Often collections offer at least a side chair and arm chair option and you can decide if you'd like to use side chairs all the way around the table or if you like the look of the arm chairs anchoring the table at each end. For an updated look, try host chairs at each end that are upholstered and side chairs at the sides! This look breaks up all of the wood of traditional dining rooms and offers a different look at the ends that's still cohesive with the overall design. Try a bench! 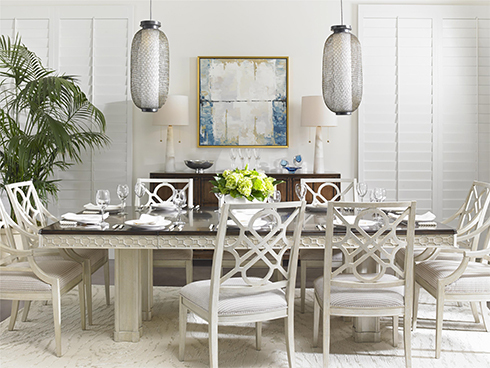 Dining benches are great options for an updated dining room. Kids love to gather together on a dining bench and you can choose to place two benches at each side of your table or use one and simply pair side chairs across. The newest dining trend is banquettes and you can't go wrong with them! Whether you choose a tufted or tightly upholstered style, these dining banquettes bring sophistication to your dining room. Many are also offered in Sunbrella fabrics that allow you to live life without worry since they're built and treated to withstand stains and are easily cleaned. China cabinets, buffets, or dining sideboards - how do you pick? The options vary for dining storage depending upon each dining collection's style but you also may have multiple options within a collection. Think about what storage you need and what functionality would be helpful. If you'd love a place to store your prized family heirloom china, a china cabinet with glass doors may be the best option for you. Prefer to entertain guests in a comfortable environment? Opt for a sideboard or buffet that includes wine bottle storage and a surface space for placing your drink options or serving appetizers to your guests. View these dining essentials and hundreds of room settings at Belfort Furniture's Furniture Showroom in Dulles, Virginia. Your ideal source of inspiration and design advice is waiting for you - or simply shop online!